The final runoff vote in the French presidential election between centrist candidate Emmanuel Macron and his far-right opponent, Marine Le Pen, is only a few days away, and experts are frantically trying to make predictions and forecast a winner. But it looks like everyone is going to need to reevaluate their Election Day predictions, because Marine Le Pen is surging in the polls after pledging that, if elected president, she would restrict France’s population to the 10 Frenchest people on Earth. Wow! Her commitment to French cultural purity and her demands that all but the 10 most French people in the world leave the country has immediately resonated with conservative voters throughout France and caused her poll numbers to soar. 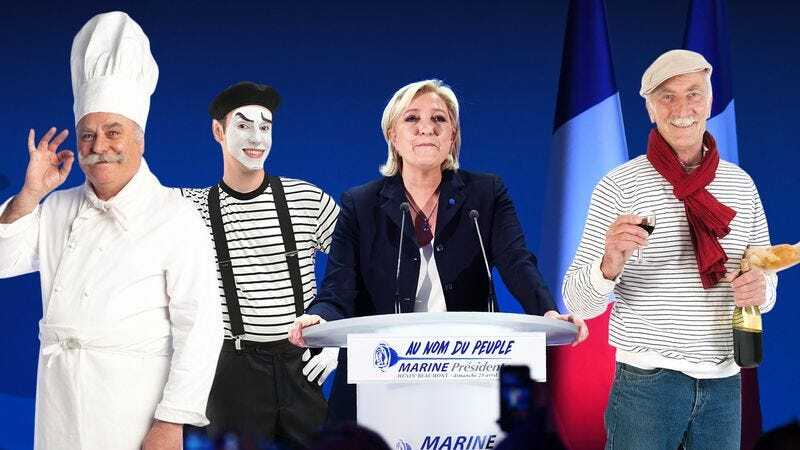 “The 10 people standing behind me are the only people French enough to remain in the country,” Le Pen said in a press conference yesterday where she introduced the small group of extremely French people she would permit to stay in France, which included a mime who plays the accordion and only performs in the shadow of the Eiffel Tower, a pastry chef who plays the accordion named Français du Boeuf, and a direct descendant of Napoleon named Baguette la Baguette who gets paid in cigarettes to cry while he samples a cheese plate. Le Pen has announced that she does not consider herself to be one of the 10 Frenchest people in the world, and that if elected, she will forfeit her French nationality and leave the country along with roughly 67 million other French residents who the candidate feels are simply not French enough to remain in France. Emmanuel Macron better watch out, because Le Pen has got French nationalists fired up and excited to vote for her on Election Day! It will be fascinating to see if Le Pen’s commitment to ridding France of all but the top 10 Frenchest people is enough to carry her to the presidency. We’ll just have to hold our breath and see what happens!